One of the main areas of research at the Centre for the Study of Molecular Mechanisms of Ageing and Age-Related Diseases – set to open at The Moscow Institute of Physics and Technology – will be membrane proteins. Proteins are essential to all living organisms – they act as regulators in signal reception and in manipulations involving DNA and the conversion of energy. About a quarter of the proteins encoded by the human genome are membrane proteins and form part of cell membranes or the membranes of intracellular organelles. Membrane proteins are responsible for the interaction of a cell with its external medium. For example, membrane protein receptors interact with adrenaline released into the blood transmitting the required signal within a cell. Malfunctions in membrane proteins cause disruptions in the “communication” between various parts of the body. This is the reason why approximately 60% of drugs are designed to target membrane proteins in particular. Membrane proteins play a key role in existing theories of the mechanisms of ageing at a molecular level. According to the free radical theory of ageing, which was developed by researchers at the N.M. Emanuel Institute of Biochemical Physics, damage is caused to the cells of the human body over time by highly reactive free radicals. They rapidly oxidise lipids – from which the membranes are built and from and where the membrane proteins are found. Many ageing theories focus on the role of membrane proteins. This process of oxidisation causes the membrane proteins to malfunction – they, for example, make errors in transmitting signals, or generating energy. It has been established that as we grow older, mitochondria – which provide energy in the form of adenosine triphosphate (ATP) – begin to deteriorate in the body’s cells. In order to synthesize ATP, a huge amount of oxygen is needed and many membrane proteins are involved in the process. The disruption in the function of the membrane proteins is what causes the death of a cell. 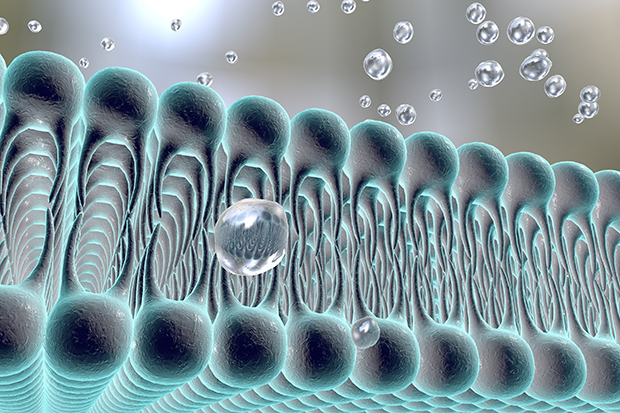 Researchers are analysing the changes in the membrane structure and the behaviour of membrane proteins and are looking for ways to compensate for the effects of harmful factors on the proteins. In addition to this, scientists are actively studying light-sensitive membrane proteins that act as molecular “pumps” and channels. They transfer ions from one side of a membrane to the other under the action of light. The function of light-sensitive channels is somewhat similar to the way in which ion channels transmit nerve impulses. Two different types of ions are used to transmit an impulse along the neuron of a nerve cell – potassium and sodium. Ions are transferred from one side of the membrane to the other via potassium and sodium channels, the operation of which is controlled by an electric field. Any disruption to the function of these channels makes it impossible for nerve impulses to be transmitted. Recently, scientists proposed substituting electro-sensitive channels with light-sensitive channels in order to transmit impulses along a neuron. Optogenetics uses light to control biological processes in cells. This field of research has been named optogenetics. It works in the following way: a gene encoding a light-sensitive channel is introduced into a nerve cell, the cell synthesises the channel and it becomes embedded in the membrane. The flow of ions through the membrane can then be controlled by light, stimulating the transmission of nerve impulses along a neuron. Studies such as these are already being conducted at MIPT in conjunction with Research Centre Jülich (Germany) and Institut de Biologie Structurale (Grenoble, France) under the direction of Professor Valentin Gordeliy. While conducting these studies, researchers defined the spatial structure of the KR2 channel found in the cell membrane of the marine bacterium Dokdonia eikasta. In this bacterium, the pore domain is structured in such a way that it only allows sodium ions to pass through. 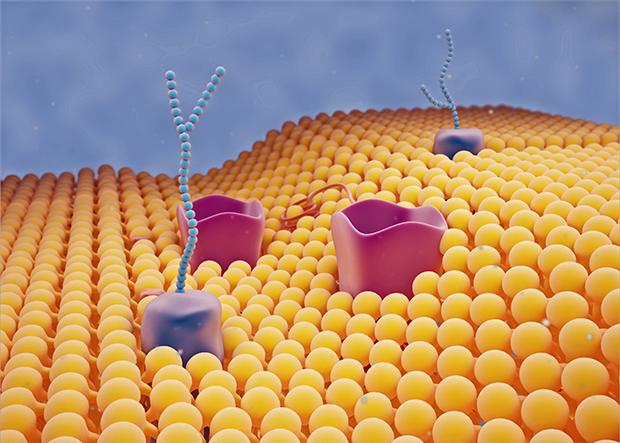 A team of scientists from MIPT managed to alter the channel’s “specialisation” from sodium ions to potassium ions by substituting certain amino acids using targeted mutations in the pore domain. The result was an artificially constructed, light-activated potassium pump. And very recently, scientists from MIPT and their German and French colleagues from Research Centre Jülich, Max Planck Institute of Biophysics and Institut de Biologie Structurale analysed the structure and subsequently proposed a theory for the molecular mechanism of the process. When exposed to light, the retinal (a polyene chromophore and the light-driven element in the structure of a pump) undergoes a change, and allows a molecule of sodium to enter the protein. When the sodium enters the protein, the retinal changes again, preventing the sodium from returning in the direction it came from. When the sodium is released, the protein returns to its original state and is ready to absorb the next photon. The scientists also analysed the influence of oligomers (groups of a small number of proteins close to each other) in a membrane on the function of the pump. It was found that the width of the “gates” that allow an ion to pass through in the proteins of these complexes is slightly larger than in monomeric KR2 – 12 angstroms compared to 10. In other pumps with known structures responsible for proton transfer, this distance can also be measured and it will be less than in KR2. These recent discoveries in optogenetics provide hope that sooner or later scientists will be able to “program” the transport of potassium ions using external light sources, which will create a wide range of possibilities for further experiments and research. And the protein KR2 stands a good chance of becoming a key tool in this new field of science.